Water from the Rio Grande and underground are shared across the border. Both sides try to just take what they need, and they share information, so no one accidentally overdraws. The Rio Grande isn’t as full as it used to be. And that’s a problem for everyone who shares the river. Texas claims that New Mexico is keeping more than its fair share of the water. And it’s actually suing that state and Colorado in a case that’s gone to the Supreme Court. But the Rio Grande doesn’t just flow through the U.S. It also feeds Mexico. Officials on both sides of the border are concerned about water scarcity, and they are taking new measures to conserve the resource. I’m standing inside the Kay Bailey Hutchison Desalination Plant in El Paso, in a room full of long, white tubes. Here, brackish groundwater gets turned into fresh, drinkable water. It’s pumped through these tubes at extremely high pressure, leaving behind salt and bacteria. Desalination plants are usually built near the ocean, where there’s a vast supply of salty water. This one in El Paso is the largest inland desalination plant in the country. Gilbert Trejo is with El Paso Water, the local utility. He says this plant is part of a larger plan to make sure the city doesn’t run out of water. “We’re diversifying our water portfolio,” he says. It’s pretty obvious there isn’t a ton of water in El Paso. The landscape is dusty brown. Front lawns are filled with rocks and desert plants. The two sources of water here are the Rio Grande and a couple of aquifers. But they’re not just for El Paso. “You know, groundwater basins don’t see political boundaries,” Trejo says. Water from the Rio Grande and underground are shared across the border with Ciudad Juarez. It’s a delicate balance. There’s a treaty that determines how the river gets shared. But there’s no rule about the aquifers. Both sides try to just take what they need. And they share information, so no one accidentally overdraws. “If we’d both be doing it in a vacuum, without communication, we could dry each others’ wells out,” Trejo says. At least that’s how it’s worked for decades. But now there’s a problem. Because there are new pressures on those water sources. Because there’s less snowfall in Colorado, there’s less water in the Rio Grande. Typically the snow melts and feeds the river. Now there’s less water, but more demand. These cities have to get creative about water management. And El Paso is doing that. It built that giant desalination plant. It’s also buying land and water rights in the neighboring county to pipe water in down the road. And it’s designing a facility to turn wastewater into clean drinking water and deliver it directly to customers’ faucets. El Paso Water’s Gilbert Trejo says all this comes at a price. But while El Paso may be able to afford that investment, Juarez has so far found it cost prohibitive to build a surface water treatment plant. It’s much more dependent on the aquifers. But Ciudad Juarez engineering teacher Alfredo Granados says that city is taking other measures to conserve and reuse water. Measures like preventing leaks, harvesting rainwater, and helping farmers use water more efficiently. Plus, he says, “100% of our wastewater has been treated.” While it’s not drinkable like El Paso’s is, that treated wastewater is reused for irrigation. Granados recently came to El Paso for a binational water summit hosted by El Paso Water and UT El-Paso. It brought together experts and officials from both sides of the border to share knowledge and solutions, something he says is critical. Last fall the U.S. and Mexico signed an agreement about how they’ll manage the Colorado River in times of intense drought. 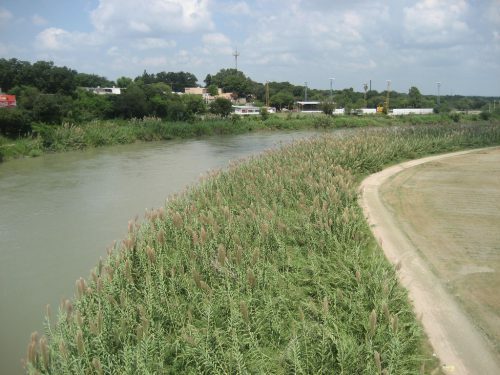 Some water experts would like to see a similar pact here on the Rio Grande. This entry was posted in KRTS News, KXWT News and tagged El Paso, Juarez, Rio Grande, Water. Bookmark the permalink.